Not actually a Pixar film, this Cars spin-off got 25/49 on RT and 5+ from CommonSenseMedia. There are a handful of amusing jokes in here (the accent of the JFK air traffic control tower is the best one), but this is an awful movie. 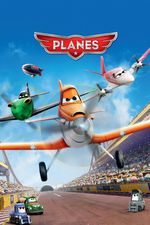 The sequel (Planes: Fire & Rescue) is vastly, vastly superior. Planes also lets us know that World War 2 occurred in the Cars universe. So there's that. And what flies on the 747s? Like why do you need big jets? Well... cars I would assume. You ever try to fly a car somewhere on a Beechcraft Baron? My kids were 5 when this movie came out. Disney initially previewed it with this fantastic trailer. They should have stopped there. My son watched the movie once, enjoyed it and never asked to see it again. My daughter thought it was boring and was unhappy that the female characters didn't do anything. I left the theater annoyed that the movie undermined a message we were trying to emphasize with our kids at the time: that women can do just about anything a man can, that a woman doesn't need a man to succeed, and that a woman doesn't need to be secondary to a man in any way. Two female racing planes. One female mechanic. They exist either as love interests for or assistants to the male planes. There's a sexist joke where Dusty mocks slower planes by calling them "ladies." Really? Also, it's filled with racist stereotypes. When I take my kids to the movies, I don't want to have to re-educate them afterwards to counter sexism and racism. Turbo came out around the same time and had a similar plot, without as much overt sexism. But it's still there. In Turbo an underdog boy snail wins the Indy 500. There are three female characters in the movie -- a human car mechanic (sound familiar?) a human woman played by Ken Jeong, and a racing snail who is part of a posse. None of the women racers in either movie will win anything. I'm pretty sure both movies fail the Bechdel test. The best part of Planes was the bit after where my 3 year old could not quite remember the name "Dusty" and would fly around the house saying "I'm Nasty the Plane!" Even that did not make up for the 90 minutes of life lost. I agree with the general sentiment. Disney decides to hand off the Cars universe to a sub-studio (DisneyToon Studios, most recently responsible for the actually pretty good Tinkerbell movies) and they make... another racing movie. With lots of rah-rah Americana.